After having dreads for over 10 years I finally made the decision to take them out. I do miss them already but a decade of the same look can be a tad monotonous. It took me over a year to decide to do the deed. Because I, as most everyone else believes, thought that you had to cut out your dreadlocks when your ready for a change. But fortunately I found out that is not the case! You can comb out your dreads with the right amount of patience and time. First a little history, I made the decision to get dread locks when I was 18 years old and had just moved out to go to college at an Art School. I ordered a dread locking kit from Dread Head HQ online that contained a shampoo, dread locking accelerator, beeswax and a metal tooth comb. My Mom and I spent two days separating my hair into small sections then backcombing (aka teasing) my hair and rubbing the beeswax into each dread. We would then blow dry it to melt the wax to coat the entire dread lock. This would help it to hold together until they matured into tight locks. We also used small rubber bands at the ends that I later cut out when the dreads were strong enough. Over the years I would get many different reactions, most of them complimentary. Most people were just intrigued and would wonder if and how I would wash it. Yes, I did wash and keep my hair very clean. It was simple to wash and it was a breeze to maintain. To maintain the dreads as they grew out I would wiggle my finger through the dread close to my scalp and make a hole. Then I would pull the end of the dread lock through the hole at the scalp to tighten it. I would sometimes do that in a couple of different directions on each dread until it was tight all the way to the top. That would also capture the loose hairs that would come out with day to day wear. So when I first made the decision to get dread locks, I did not make it hastily. I knew that I would be looked at differently and that it was a major commitment that would affect the jobs I would apply for and how people perceived me. I set a goal for myself at that point that I would have them for a least 10 years because I like a good commitment, and I thought why do such a drastic thing If only to cut them out a year or so later. Fast forward 10 and a half years later and I am happily dread free with long healthy hair! How did I do it? With lots and lots of time and patience. First I cut my hair shoulder length to have less to work with. Then I went down to the local dog wash and picked up a couple of dog grooming combs. This is important because they have extremely hard bristles that I was able to pick at each dread and not break the comb. I experimented with different conditioners and oils, combing while it was wet and while it was dry to find the right technique. Eventually I settled on just picking at one dread starting at the bottom and using the tip of the comb when my hair was dry. When I would get to a big snarl or chunk of junk (a combination of dead hair, sebum, and shampoo) I would move on to another dread. 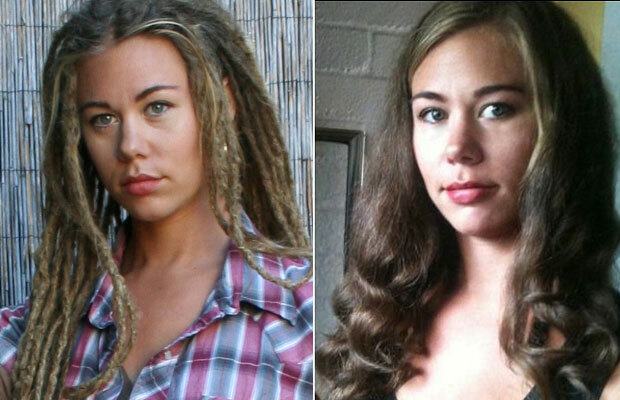 When I had a few dreads at a stopping point I would wash my hair with a really good clarifying shampoo. I used Redken’s for Clarifying and Joico for a really good reconstructive conditioner afterwards. This removal process does not take overnight, especially since I had them for so long. But removing your dreads without cutting them off IS possible! Let me know if you have any questions and I’ll be happy to help! will removing my dreads be super easy because I have only had them in for a month? I am 21 and thinking about starting my dread journey so to say, but I worry about the professional aspect. How was it for you to get a job ?